This crab recipes is a spicy freshwater crabs dish, also known as mud crabs which is cooked in tomato sauce, chilies, oyster sauce, soy sauce, sesame oil and other spices. 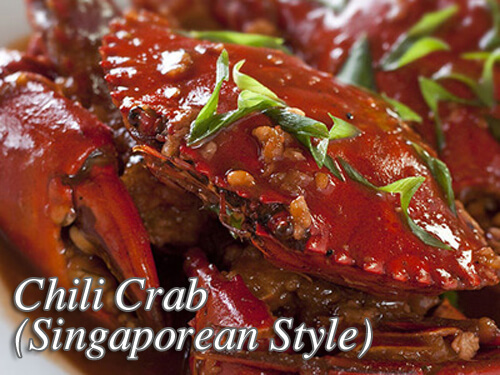 This recipe is a Singaporean style chili crab which many Filipinos loves. These mud crabs (alimango) should not be mistaken to saltwater crabs like the blue crabs (alimasag) what we always see in the wet market. But I think this can also be used as an alternative is mud crabs are not available or if your budget is not sufficient enough to buy mud crabs. They are pricey compared to blue crabs and sometimes vendors sell malnourished crabs that you will end up just cooking their shells with little crab meat. So just we be wise enough to buy fat mud crabs. To cook chili crabs; Scrub crabs with stiff brush and rinse well under cold running water. Remove claws and smash slightly. Chop crab backs into medium size pieces taking care to discard grey and pulpy matter. Chop chilis, ginger and garlic. Heat oil in a wok and cook crabs for 1 to 2 minutes. Return crab to heat, add sugar, salt and freshly ground pepper. Stir well then bring to a boil. Cover pan and simmer slowly until crab is cooked, approximately 15 minutes. Remove cover and add vinegar, soy sauce and tomato sauce. Beat egg lightly, add this to sauce and stir for a minute until egg begins to set and sauce thickens slightly. Add oyster sauce and sesame oil when done. To see the rest of the recipe with the exact measurement of ingredients, continue reading. This crab recipes is a spicy freshwater crabs dish, also known as mud crabs cooked which is cooked in tomato sauce, chilies, oyster sauce, soy sauce, sesame oil and other spices. Scrub crabs with stiff brush and rinse well under cold running water. Remove claws and smash slightly. Chop crab backs into medium size pieces taking care to discard grey and pulpy matter. Chop chilis, ginger and garlic. Heat oil in a wok and cook crabs for 1 to 2 minutes. Return crab to heat, add sugar, salt and freshly ground pepper. Stir well then bring to a boil. Cover pan and simmer slowly until crab is cooked, approximately 15 minutes. Remove cover and add vinegar, soy sauce and tomato sauce. Beat egg lightly, add this to sauce and stir for a minute until egg begins to set and sauce thickens slightly. Add oyster sauce and sesame oil when done. Hi, thanks for this chili crab recipe! Looks delicious!